Obituary for Rev. Cornelius F. O'Leary | Boucher Funeral Home, Inc.
Reverend Cornelius F. O’Leary, 89, died peacefully Thursday, February 7, 2019 in Notre Dame Health Care Center Inc. of Worcester, following an illness. Born in Worcester on August 19, 1929, he was the son of the late Cornelius J. and Margaret R. (Kane) O’Leary. 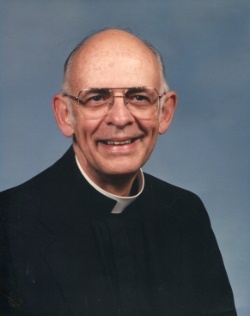 Reverend O’Leary graduated from St. Peter’s High School of Worcester in 1947, and earned his Bachelor’s Degree in Business Administration from Holy Cross College of Worcester in 1951. He graduated from St. Mary’s Seminary and University of Baltimore, Maryland in 1956 and was ordained into the Priesthood on May 10, 1956 at St. Paul’s Cathedral in Worcester by Bishop John Wright. His first assignment was at St. Bridget’s Church of Millbury from 1956-1957, followed by assignments at St. Leo Church of Leominster from 1961-1962, St. Mary’s Church of Uxbridge from 1962-1966, Ascension Parish of Worcester from 1966-1969, St. Joseph’s Catholic Church of Auburn from 1969-1973, Our Lady of the Rosary Parish of Worcester from 1973-1976, and St. Anne’s Church of Southborough from 1976-1979. His final assignment was Pastor of St. Martins Parish of Otter River from 1979-2004. Following retirement from active priesthood he moved to Notre Dame du Lac of Worcester. Reverend O’Leary was a Third-Degree member of the Knights of Columbus of Baltimore, MD. He leaves his brother, Stephen K. O’Leary and his wife Patricia of Streetsboro, OH; several nieces, nephews and one cousin. Besides his parents, Reverend O’Leary was predeceased by his brother, Brian J. O’Leary; and sister, Therese E. Heon. Bishop McManus celebrated a Mass of Christian Burial Monday, February 11th in the Notre Dame du Lac Chapel of Worcester. Burial was held on Tuesday, February 12th in St. John’s Cemetery of Worcester.